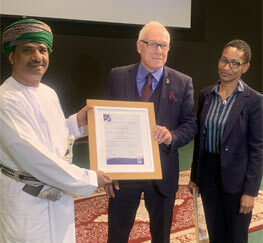 Dhofar University, represented by its Vice-Chancellor Prof. Hassan Bin Said Kashoob, receives International Accreditation with a Premier Status form the Accreditation Services for International Schools, Colleges and Universities, (ASIC) from UK (Britain) and is the first University in the Sultanate of Oman to get this kind of accreditation. Dhofar University celebrated this in a ceremony that included a number of its Board of Trustees and Board of Directors. It also included representatives of the local community and Dhofar University’s faculty, staff and students. In the ceremony, Dr. Sanjay Ramteke (the Director of Quality Assurance) thanked Board of Trustees, Board of Directors, Vice-Chancellor Prof. Hassan Bin Said Kashoob and Deputy Vice-Chancellor Prof. Mohamed Limam for their full support and involvement and also thanked Dhofar University’s Faculty and Staff. He also stated that the University seeks to get program accreditation from professional bodies like ABET for engineering programs and AACSB for business programs. Dr. Sanjay also added that henceforth the University will work in close collaboration with ASIC for the next four years. ASIC shall act as a consultancy agency to guide the University in enhancing its quality of education and strengthening its management system. It is worth mentioning that the initiative to have an external consultant came from the Board of Trustees. ASIC started its accreditation process by studying Dhofar University’s application that was submitted according to their standards. The Inspection Panel which includes four members and a representative from Ministry of Higher Education visited the University for evaluation. They inspected the University’s facilities, attended some lectures and held meeting with management team, selected faculty, staff & students. ASIC is well known international accreditation authorities. It is approved as an accrediting body by the British government. It is also a member of the British Quality Foundation. Currently it is operating in 65 countries with more than 250 accredited institutions around the world.